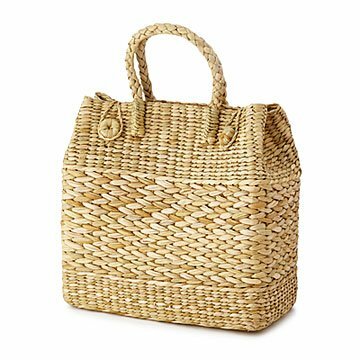 Artisans in India craft this entire bag—clasps, handles, and all—from sturdy dried water reeds. Your farmer's market fare, picnic spread, and beach day essentials should be carried in style. Cue this gorgeous handwoven bag. It's adventure ready, but also makes an elegant everyday purse. Artisans in India craft the design from sturdy water reeds, finishing each with unique woven straps. Give the special piece to a fashionable friend with that "fresh from the beach" vibe. Handmade in India. Naushad Mohd Ansari devoted her life to weaving around age 28. She was inspired by nature and her travels to tribal areas across the world. "Little by little, I learned to design and weave a bit," she says. To create, Naushad starts with a design in mind: a basket, handbag, or bin, for example. She then drafts the concept using a pencil, protractor, and ruler to make sure the lines and shapes are exact. "I feel very proud of the works I create," she says, "and I look forward to sharing them with more people around the world." You can wipe the product with a wet cloth. And put it in direct sunlight to dry.